BOSTON—On October 29 and 30, Harvard Business School marked the tenth anniversary of the financial crisis that rocked the US and world economies in 2008 with a two-day conference that brought together in Klarman Hall, the School’s new convening center, an extraordinary lineup of experts, many of whom had played key roles in the events that unfolded a decade ago, including former US Treasury Secretary Henry “Hank” Paulson (MBA 1970); Tim Geithner, then president of the Federal Reserve Bank of New York and Paulson’s successor at Treasury; and Harvard University professor Lawrence Summers, who served as Director of the National Economic Council from 2009 to 2010. Organized by Harvard Business School finance professors Robin Greenwood and David Scharfstein and attended by some 300 guests, the conference began on the afternoon of October 29 with a discussion of two new cases written especially for the occasion. “Fighting a Financial Crisis, Part 1: Henry Paulson and the Columbus Day Weekend” chronicles such momentous events as the fall of Lehman Brothers, which occurred on September 15, 2008, and the decision to provide emergency funding from the Federal Reserve to support JP Morgan Chase’s rescue purchase of Bear Stearns. By bringing together the CEOs of the nine largest US banks to meet with him, Geithner, Federal Reserve Chairman Ben Bernanke, and Sheila Blair, chair of the Federal Deposit Insurance Corporation, Paulson wanted to announce the latest government actions to stabilize the wobbly US financial system before the markets reopened the day after the holiday. Part 2 of the case, “Tim Geithner and the Stress Tests,” focuses on his efforts as the newly-appointed Secretary of the Treasury in the Obama administration to make sure that the largest US banks had enough capital in place to withstand a worst-case recession in the future. The conference’s proceedings continued with a “fireside” chat with both Geithner and Paulson, moderated by former Wall Street Journal economics editor and columnist David Wessel, now Director of the Hutchins Center on Fiscal and Monetary Policy at the Brookings Institution. HBS finance professor Luis Viceira brought the first day’s activities to an end after dinner with a discussion with Professor Summers. The next day, after a welcome by Harvard President Lawrence Bacow, the conference reconvened with a panel discussion moderated by Professor Emeritus Andre Perold and featuring financial gurus Ray Dalio (MBA 1973), President and Chief Investment Officer of Bridgewater Associates; Mary Erdoes (MBA 1993), CEO of JP Morgan Asset & Wealth Management; and Seth Klarman (MBA 1982), CEO and Portfolio Manager of The Baupost Group. Audience participants then had their pick of an extensive series of research presentations, including Investor Psychology and Financial Fragility, Unelected Power: Central Banking and the Regulatory State, Alternative Investing in the Quantitative Easing Era, and Eight Centuries of Financial Folly. Among the leaders of these sessions was Sir Paul Tucker, former Deputy Governor of the Bank of England, and former HBS Dean Jay Light. 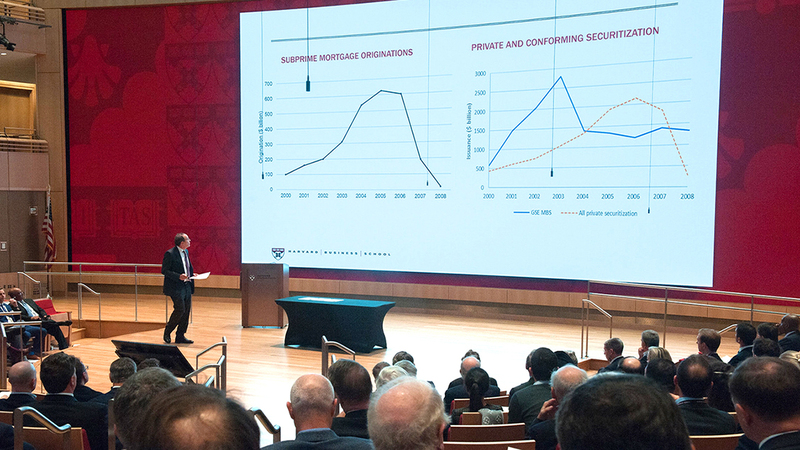 The conference ended with a discussion between HBS professor Rafael Di Tella and former Harvard Business School and Harvard University professor Niall Ferguson, now a Senior Fellow at Stanford’s Hoover Institution, putting the 2008 financial crisis in historical perspective. “Thanks to the unique convening power of Harvard Business School, we were able to bring together at one time a remarkable group of policy makers, investors, academics, and influencers who through their participation in this conference helped all of us better understand the past and prepare more effectively for what the future may hold,” said Professor Greenwood, who leads Harvard Business School’s pioneering Behavioral Finance and Financial Stability Project. Launched in 2016, the Project supports research collaborations between faculty and students across Harvard to understand, predict, and prevent financial instability.